For all fans of The Walking Dead, Citizen Brick has come out with the Zombie Hunting Enthusiast Custom Minifigure. Sure, zombies are slow, but hunting them is no weekend hobby. Loyal and lethal, this is the dude you want on your side when the dead start walking. 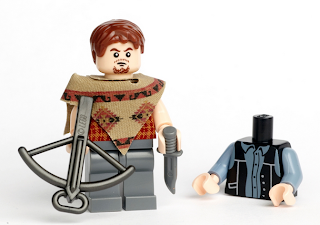 Quite possibly our most stunning minifig to date, this deluxe design comes with crossbow, hunting knife, poncho, a bonus biker vest torso. All the apocalyptic detail you've come to expect from Citizen Brick! The Minifigure retails for $20 USD, head over to Citizen Brick to pick one up.